with the door/window paint or not paint issue. and…yes… that would be a drop cloth on the desk…still a work in progress. oy. I’m finishing it all today. More pic’s to come. and all Dad’s. You rock. and…could’ja move the Piano for me? someone??? pretty please cherry on top? My paint program skills are amazing...no? Ok…talk about airing dirty laundry. ewwwww. I know some of you prefer to see perfectly dolled up after shots…and raunchy before’s. filthy and gritty real life in-betweens. 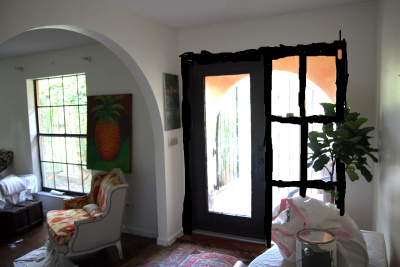 So…Would you paint the door black/brown? would you keep going…and paint the windows and door molding next to the door the same color? like I kinda started doing…then stopped…then took a picture. lovely. oh joy. This is so real it is sad. 1. Paint it all back white. 2. Leave the door dark and windows and frame white. 3. Both door and windows dark. 4. Clean the dayum house already. Geez. Did you know you could gain weight by painting your living room? One of the foods that make the food police quiver and stop dead in their tracks. be very careful of your color choices when painting. …and make it for dinner. a blog from a delightful looking home furnishings shop. I was invited to do a guest post…on Florida color. What’s the rule of layering textures and colors again?